The main theme of this article is “what for” and “what purpose” Industrie 4.0 has been developed and implemented. In April 2013, the final report “Recommendations for implementing the strategic initiative INDUSTRIE4.0” was released by the working group of German Academy of Science and Engineering (called acatech). Thankfully, the Japanese version edited by Mr. Naoaki Fujino, a chief researcher of Nomura Research Institute, Ltd. was released and is posted on the acatech website. aiming at digitalization and computerization of Manufacturers. realizing mass customization, a custom-tailored goods manufacturing technique. minimize the cost and improve productivity by promoting automation and virtualization with digitalized production process and distribution process. In short, it is a national strategy which increases competitiveness of Germany, in our common understanding. However, the final report also includes the following phrases. In addition, Industrie 4.0 will address and solve some of the challenges facing the world today such as resource and energy efficiency, urban production and demographic change. Industrie 4.0 enables continuous resource productivity and efficiency gains to be delivered across the entire value network. Let’s see what are “the challenges facing the world today” that has not taken much attention so far, and what are the solutions brought by Industrie 4.0. 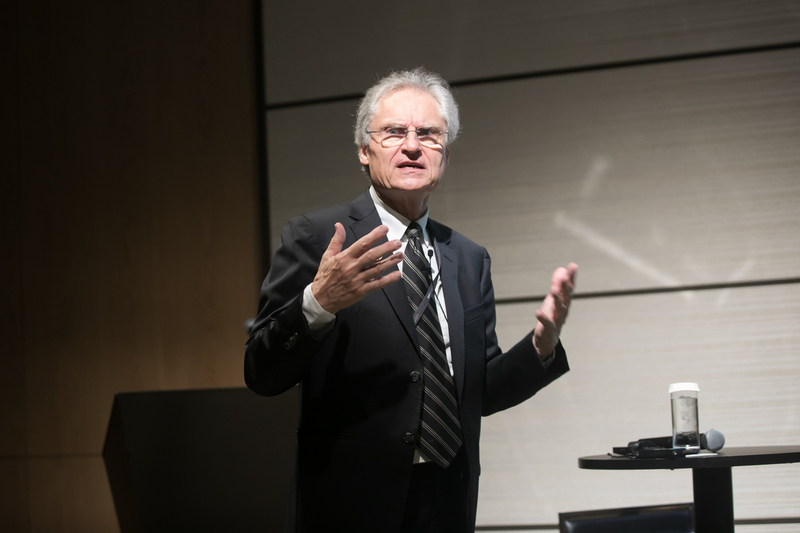 At the beginning of August this year, we had an event called SAP NOW by welcoming Prof. Dr. Henning Kagermann who was former CEO of acatch (retired in May) and had lead INDUSTRIE 4.0 (hereinafter referred to as I40). In his keynote speech, he said that the goal of Industrie 4.0 was to improve the competitiveness of German that had experienced economic crisis. Before that main event, we had a closed conference with restricted guests involved in the management of manufacturing companies. And what Dr. Kagermann said in there, “the true purpose of planning and promoting I40” was so deep and thought-provoking. Let me introduce the contents of his talk. First, he stated the fact that the discussion like “what is the fundamental problems?” came up for debate beyond national units, although it was after the release of I40. Next, there was a comment on what kind of concept was “circular economy” as an answer to that issue. Around 2015, there were discussions in EU on what the business world should do to keep the Earth as a place to live, looking forward to the next 20 to 30 years. Acatech suggested the necessity of “Circular Economy” which eliminates structural waste and circulates, while paying attention on the excessive resource consumption and unused waste. UN moved forward to establish SDGs at the same time, so people started to reconsider how we could transform the current one-way economy into a circular economy. The concept of “circular economy” is closely related to what 4 to 5 SDGs targets are aiming at. The German government entrusted acatech to create roadmap toward “Circular Economy”. It is surprising to see the statistics announced by Europe in 2016. As of 2012, we consumed 1.6 times the required amount of earth resources and produced products not to be used. (Estimation: 2% of cars, 35-50% for office use) And then, they were discarded on average of nine years. (including average life period of buildings – twenty-eight years). And the most critical issue we need to recognize is the fact that only 5% of resources are collected as recyclable ones. Then, he shared an image of “Circular Economy” where we should look for. 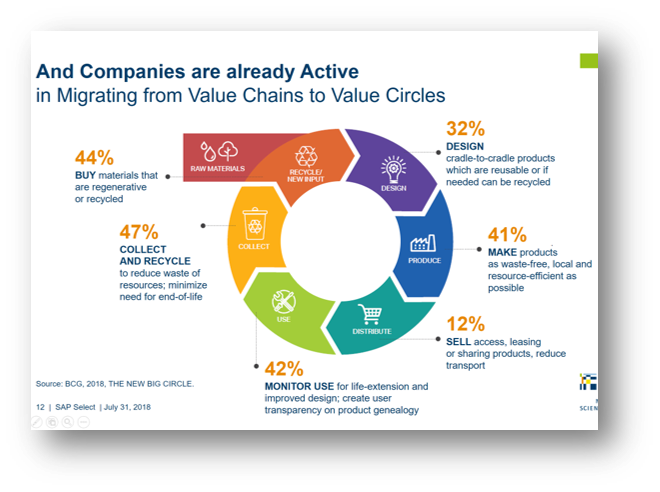 The picture on the right, by Boston Consulting Group, describes the rate of companies paying attention to Circular Economy as of 2018. Collect or recycle products to reduce waste. Dr. Kagermann said DISTRIBUTE was the most important. We are on transition from “Selling items” to “Leasing” or “Sharing” business models. Also, he gave his personal viewpoint that the most difficult to realize may be MONITOR USE, it was where to directly recognize status of customer usage. In order to realize MONITOR USE, German set the concepts Smart Services and Smart Products. That means to build a system which will reflect on the product design, manufacturing and supply of the next generation by directly monitoring usage of actual users. Here, we SAP people may remember the cases related to this field. Followings are the previous blogs in Japanese covered the field. You will see that they were designed to monitor product and precisely grasp actual usage of users at customer sites, thereby lead to the next new product or service. With those understandings, we were able to grasp the true intention of Industrie 4.0 from Dr. Kagermann. Digitalization and Cyberspace are necessary to realize those concepts. With the background info and necessity of transformation summarized in 2011, the second wave of digitalization – a concept of I40 was created. I40 is not led by technology, is essential to improve social environment. Reflect the traditional thoughts like “human-centric”, “redesigning business models driven by real data” and “platform economy” again, then add new perspectives like “SmartX”, “IoT” and “autonomous system” to there. It is the concept of “Fourth Industrial Revolution” announced in 2011 which was considering that the “sharing economy” will be the main driving force of this digital reform. True intention of I40 was NOT for improvement of German competitiveness. As explained, I40 was proposed to solve social problems at the request of society. From an economic point of view, it leads improvement in efficiency and productivity. From an environmental point of view, by using such as 3D printing, it leads to reduce energy and/or resource consumption nearly 50% and is realized to produce in an urban area close to consuming points, called “Urban Production”. And most importantly, social transformation came up to emerge. Workplaces are improved, and autonomous systems – represented by automatic driving – are incorporated people into society, which eventually create new job categories. As a result, competitiveness increases, thereby social innovation occurres. Dr. Kagermann advocates that “we must create circular economy for humanity” and I40 is one of ways to realize that. In particular, I40 is a dedicated strategy for “manufacturing companies” and it is positioned as one of three digitalization strategies in Germany. To balance the competitiveness and quality of life in the digital economy, these are surely and steadily being carried out as national strategies. Dr. Kagermann enumerated the “issues related to waste” we currently possessed, and he urged us to correctly recognize situations that must shift from one-way economy to circular economy. Although the figures of statistics are slightly different by GDP, Employment or Global Warming, the worst three of wasteful value chains are; Living Environment, Food and Mobility. 20% of products are wasted during transportation. 11% are wasted by consumers. 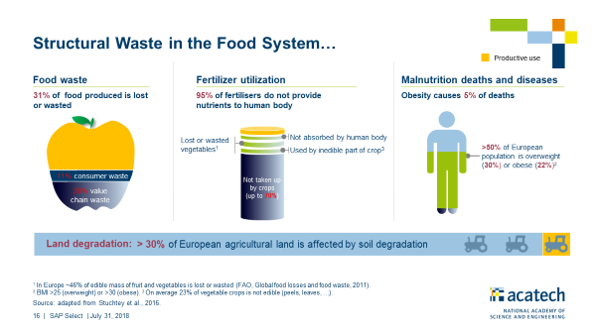 95% of fertilizers do not provide nutrients to human body. It just becomes waste. Due to these conditions, Precision Farming 4.0 needs to be promoted which is an agricultural digitalization. 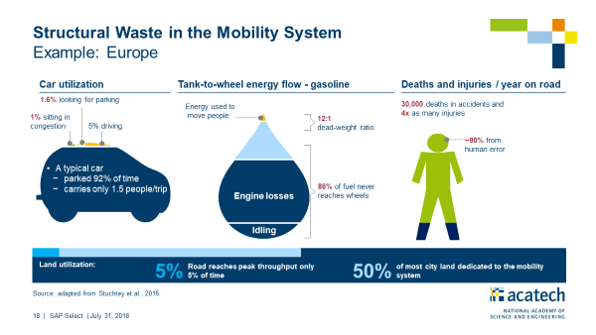 Cars are driving only 5% of time. 1% sitting in congestion. 1.6% is looking for parking. 92% is just parked. Even if it is moving, average number of passengers is only 1.5. Gasoline contributes to transportation itself is very little. 86% of fuel never reaches wheels. If we could realize autonomous mobility, distance between cars will be shorten, fewer parking lots required, and the car utilization rate will increase at least 20%. This is the new world people may realize by using mobility services and sharing. You can find more details from the following blogs in Japanese. Let me summarize again “what for” and “what purpose” I40 has been formulated from what Dr. Kagermann said in his session and other related information. If we sustain the current one-way economy, it will be worse for the Earth where we, human beings can keep living for next 20 to 30 years. We have to promptly transfer to Circular Economy. All the people in manufacturing industries need to think hard and involved in such as design products, procurement, production, delivery and waste / reuse. Also, a system is essential to share related info among many parties. The concept is called Digital Twin or Cyber Physical System, and it is the key technology to implement I40. In conclusion, I40 is NOT for “improvement of German competitiveness” but is formulated as a strategy “to address the challenge facing the world today which is feasible to bring solutions” and it is steadily being executed.